Now the one thing I made sure to have time for this week was Mom’s Chocolate Chip Meringue Cookies. I don’t know where the recipe originally came from (though I suspect mom adapted from Betty Crocker’s meringue ghost cookie recipe), but I know that it’s hands-down my favorite meringue cookie recipe ever. 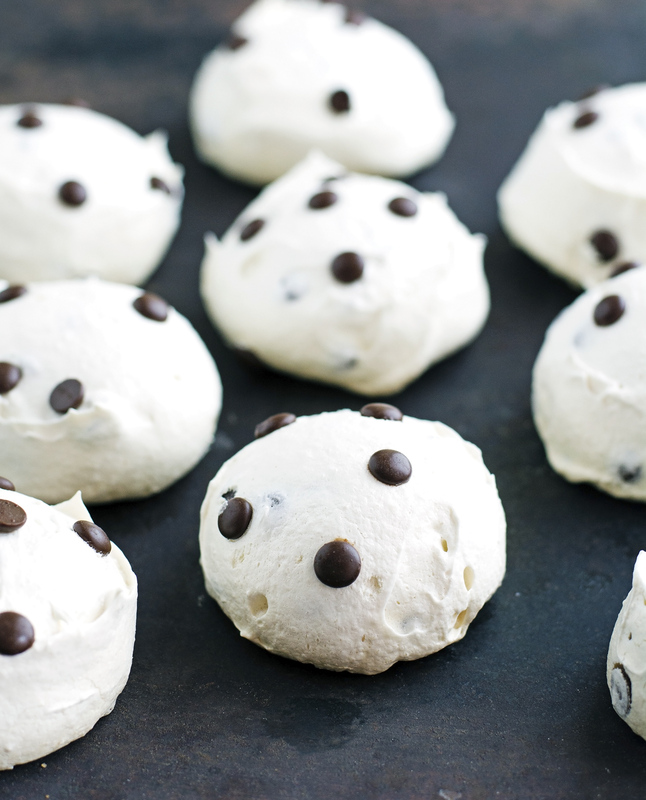 Another thing I know is that it’s not Christmas without Mom’s Chocolate Chip Meringue Cookies. They are an absolute must in our house during Christmas time. 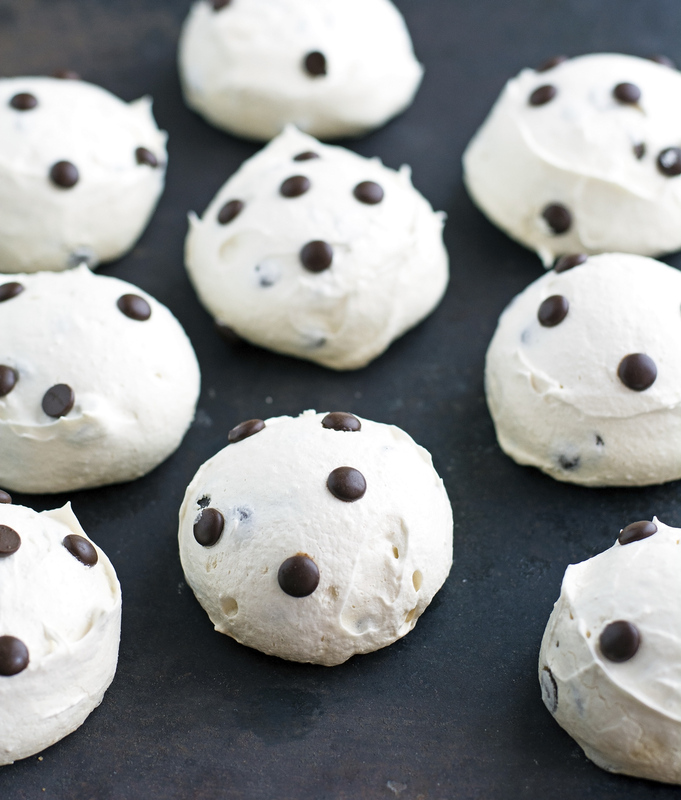 Mom’s Chocolate Chip Meringue Cookies are absurdly easy to make, have an incredibly high chip-to-cookie ratio, and you need only just 6 ingredients to make them. They look deceivingly luscious; it’s only when you reach for one that you realize that they’re light, crisp, an absolute delight to eat, and are incredibly low in calories. They dissolve in your mouth, leaving you with little bits of chocolate chips to ponder. Really, you’re going to love them as much as I do. Frankly I can’t imagine a more impressive reward for just ten minutes of cooking labor. If you’re still searching for that perfect Christmas homemade dessert, these might just be it. 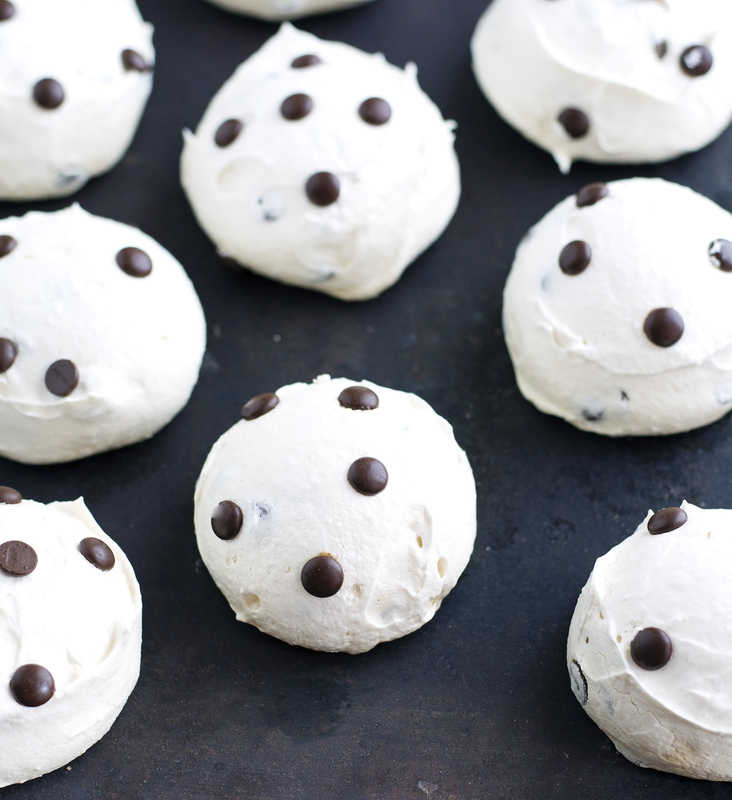 Mom’s Chocolate Chip Meringue Cookies Print this recipe! Preheat the oven to 200°F (93°C) and place a rack in the middle. Line a baking sheet with parchment paper and set aside. In a large bowl (preferably glass) beat egg whites until foamy. Add salt, cream of tartar, and vanilla, and beat mixture again until soft peaks form. Add sugar — 2 tablespoons at a time — until stiff, glossy peaks form. Egg whites will be spoonable, but keep their shape when dolloped onto a baking sheet. 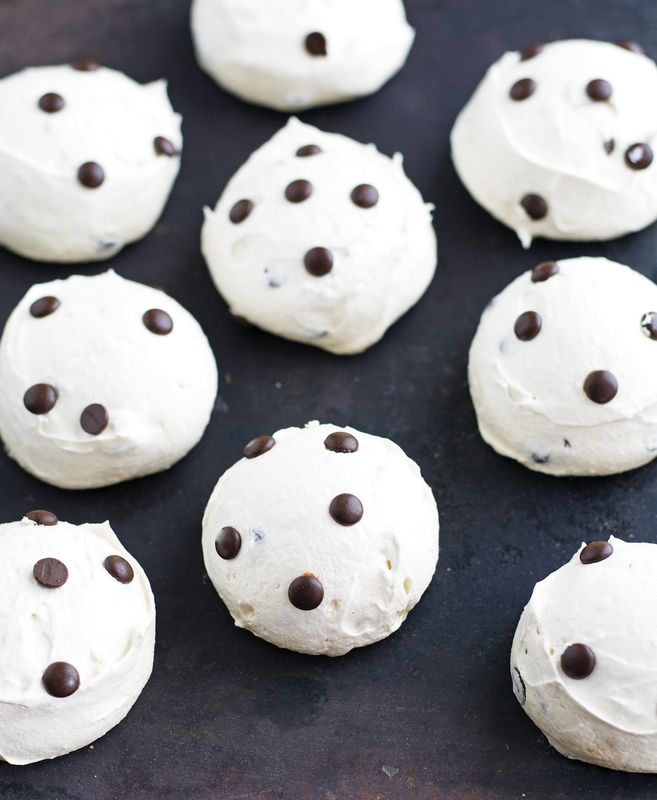 Once thick gently fold in chocolate chips. Spoon batter onto the lined baking sheet. I use an ice-cream scoop to do it — it saves time, makes equal portions, and is much neater than scraping batter off a spoon. Alternatively, you can pipe the meringue if you prefer. Bake for 2 hours, rotating the baking sheet halfway through. Please note that cooking time depends on the size of the meringues, adjust accordingly. Keep in an airtight container for up to 2 weeks. One cookie yields 57 calories, 2 grams of fat, 10 grams of carbs, and 1 gram of protein.